This concludes my weeklong exploration of making money renting apartments in Second Life. 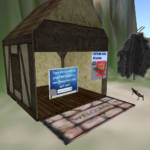 You can find me inworld as Uriel Wheeler and feel free to stop by my rental office in Avalon Estates). Step Five: Annoyances and Expansion. I’ve written my biggest policies up in the Description, but they’re in the rental agreement as well. Again, the insta-refund helps there as well. Even though I clearly state that I don’t support TVs, I still get a request about every fortnight from a new renter who assumes that I do TVs. When I reply otherwise, they (often) get a refund on thier own and everyone’s happy. Prim limits can be touchy – I’ve had tenants literally rez twice as many prims as they were allowed. I have a set policy for that as well – after the box has reminded them once or twice, I send an IM and notecard. 24 hours after that, I start returning objects until they are under the prim limit again. Stick with your niche. I rent skyboxes. I don’t custom build them for people or make modifications. I HAVE had a tenant rez thier own home on top of the skybox, which I thought was adorable (and just fine by me). Harassment – other than group chat – is best controlled by making sure that you have your security systems set up properly. Since it’s a residential area, skyboxes over 400m up, and on the edge of a sim, the tolerance for loitering is low. Putz around on the ground all you want, but not around the boxes. Also, I’ve seen the inside of my tenant’s apartments. Some of them engage in activities… well, I’m not into. 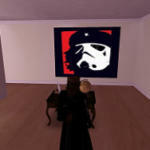 They have artwork on their walls that repels or even offends me. THIS IS NOT MY PROBLEM. There is a bit on the rental agreement that states that you shouldn’t be doing “improper” things out on the patio or roof – but what they do inside is their own business. Since I work with skyboxes, I rarely have to worry about neighbors. I would recommend putting them at “odd” heights – that way if your neighbor puts up their own box at 1000m, you’ll be at 1200 and a bit oblivious. And that, obliquely, brings us to expansion. I’ve expanded slowly – one reason why my net cashflow finally turned black. Each time previously that the skyboxes have been filled, I’ve expanded one 4096m^2 parcel at a time. Because of my usage of landmarks and routers (I use HippoRent and HippoSecure, by the way), it’s not a problem if my lots are not touching each other. What does that have to do with expansion? For about two months, I had a loud biker bar move in next to me. They swooped in, set up an elaborate club, mall, and (eventually) apartments. They finally moved out, and I think their business failed. They expanded faster than the increase in demand. I’m not making a lot of money from my rentals. Never will, really. But I’m providing a service that I both use and that I feel fulfilled in providing… while still getting enough income that I can buy stuff in SL without using “outside” money. That works for me.